Crypto-Games Dice Review – Scam or not? The difference between Crypto-Games.net from other websites is that they only offer one type of Dice Game. They have one type of Dice Game and you are able to choose which crypto currency you want to play with. Every crypto currency has the maximum and minimum bets which you are able to adjust yourself in the website. The website Crypto-Games.net offers Bitcoin, Dash, Dogecoin, Etheruem, Gridcoin, Litecoin, PlayMoney, Peercoin and Monero bets. You are able to choose from these crypto currencies before you play a game of dice with them. The game itself is called Dice, but it is not your typical craps game wherein you would just guess the sum or the numbers that would come out of the draw. That game is just pure luck and every winner is decided by a simple cube with numbers on the sides. This type of Dice game they offer is a crypto-oriented Dice game wherein you have a higher range of winning as you need to choose from 0.000 up to 99.999. You need to predict the dice rolls if they are higher or lower than a certain digit which you can easily adjust yourself. If you are new to this kind of Dice game, then let us discuss how you can start playing it. Here are the things that you need to do if you want to play a new generation of Dice game that some of the online casinos have running today. One of those casinos would be the one that we’re looking into now, which is the Crypto-Games.net. The first thing you need to do is, of course, deposit funds to the website you want to play with. To deposit Bitcoin your account in Crypto-Games.net, you first need to create an account here. Once you have created an account, it is time to deposit your Bitcoin, which you are able to do here. Now, once you are able to transfer your funds it is time to enter your bet on the desired currency you want to play with. 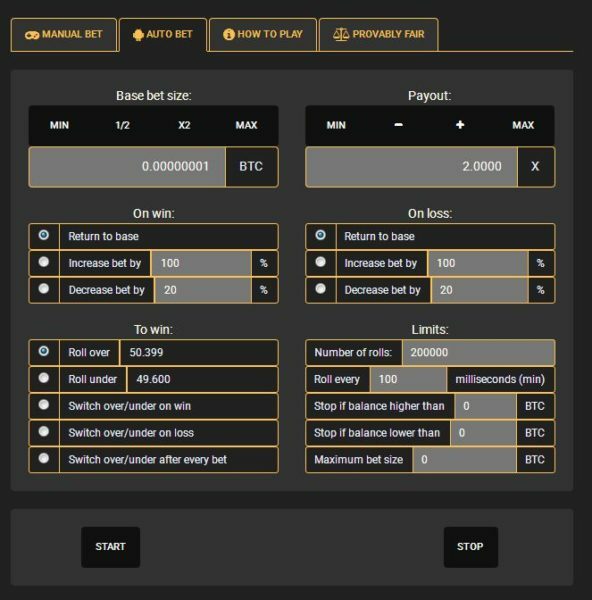 For Bitcoin bets, you are able to do it here. The third step would be to select the game multiplier. Remember, the chances of winning always depend on your multiplier. Of course, the larger the multiplier the more chances of winning but the higher your bet would become. Two numbers are shown on the “Manual Bet” area. You should either choose to roll high or low. Now the game is ready to be played. Once you have clicked on ROLL OVER or ROLL UNDER the dice will draw and will show you the results. If the number result is within your range then you win. If the number is not within the range you picked, you lose the Bitcoin that you wagered. An Auto Bet function is provided for players that are able to maximize their wins by any technique that you want to use. You are able to Increase your bet percentage or decrease it. You are also able to do this on your Win or Lose dice games. This means that every dice, you are able to change the reaction of your bets. If you lose, the automated bet system will trigger your preferences and play “smartly” depending on the information provided by you. Once you are able to decide the numbers needed to win, just click on START and the automated bet system will start rolling the dice for you. If you are into numbers, then this system would be great! The website is awesome as it introduces this new way to play Dice. Though I have seen similar dice games like this on other websites, for some this is something new. You are able to look at Crypto-Games.net Dice Games here if you are interested. An awesome website since you are able to snoop around the features without logging in or creating an account.